Eligibility: All artists 18 years or older residing in the following Michigan counties: Allegan, Barry, Berrien, Branch, Calhoun, Cass, Eaton, Ionia, Kalamazoo, Kent, Muskegon, Ottawa, St. Joseph, and Van Buren. Art Requirements: Only original work of the artist’s own design, completed within the last 2 years should be entered. Digital media, 2-D, and 3-D works in any medium will be accepted. Work may not exceed six feet (72”) on any side. Work must be on view the entire duration of the exhibition. The KIA reserves the right to refuse any work that is inappropriate, framed inadequately, or misrepresented by entry image. Award Eligibility: Art quilts must be free-hanging (unframed), fabric-based, original compositions formed by stitched layers. Quilt max dimensions may be up to 90"h x 72"w. Mixed media/intermedia award: Combining traditional and/or non-traditional media, eligible works stretch conventions of art and composition. Printmaking award: The awarded print is required to illustrate a hand worked element as part of the process in its making (no exclusively digital prints are eligible). Glass award: Over 50% of the work must be comprised of glass, but work may include some sculptural component in metal or other media. Portage Community: Eligible work must respond to theme "A Natural Place to Move" and be available to hang in City Hall lobby for 1 year following close of WMAS. Artist must be a Portage resident able to install 8-12 additional works (subject/theme may vary) in Portage City Hall Sept 14-Oct 31, 2018 (reception Sept 14). Condition of Entries: All wall-hung works must be framed with proper hanging devices (wires and/or “D”-rings) attached. Please note “top” where necessary. No clip frames are permitted. The KIA reserves the right to refuse or withdraw any work from the exhibition at its discretion. Liability: All work is submitted at the owner’s risk. Although every precaution will be taken, the KIA will not insure works during transit or while on its premises. By submitting work, the artist waives any claim against the KIA for any loss or damage. Sale of Works: Works are not offered for sale through the KIA. Visitors inquiring about availability of artists' work will be directed to contact artists independently. Delivery or Shipping of Accepted Entries: Works accepted into the WMAS must be received no later than 2 p.m., May 19, 2018. Entries may be hand-delivered to the KIA May 17-19 (Th/Fri 9 a.m. – 4 p.m., Sat 12 – 2 p.m.) or earlier by special arrangement. For directions and a map, please visit http://www.kiarts.org. Alternatively, works may be shipped via UPS or FedEx and must be sent with return postage and return mailing labels. Insurance of works in transit is the sole responsibility of the artist. The KIA will not accept works damaged in transit. Entry Fee: Cost is $20 per work; maximum 3 works may be submitted. Images: Only one image per work may be submitted. No additional views can be accepted. Please note: Works requiring special installation must be pre-arranged: call 269.349.7775, ext. 3131, no later than May 14. Reception...............................Thurs, May 24, 5:30 - 7:30 p.m.
Michigan Council for Arts and Cultural Affairs. in memory of his wife, Helen Sheridan. 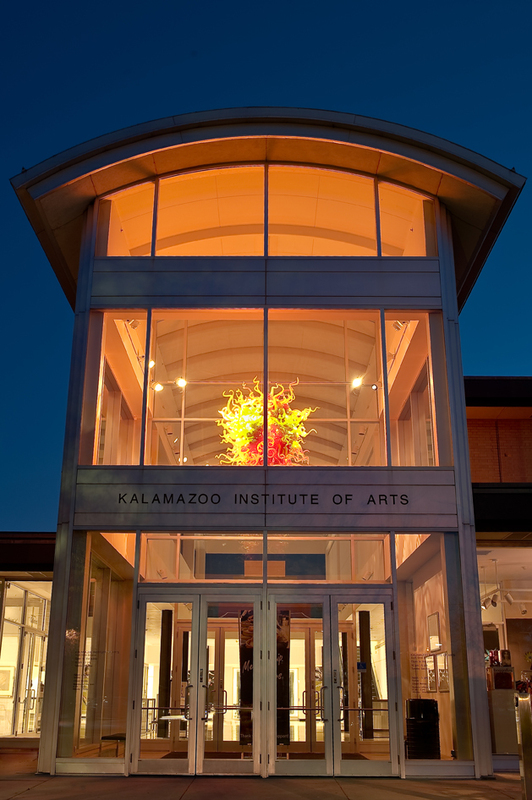 Arts Council of Greater Kalamazoo.